"COGNITIVE SECRET: Emotion determines the meaning of everything— if we’re not feeling, we’re not conscious. STORY SECRET: All story is emotion based— if we’re not feeling, we’re not reading." 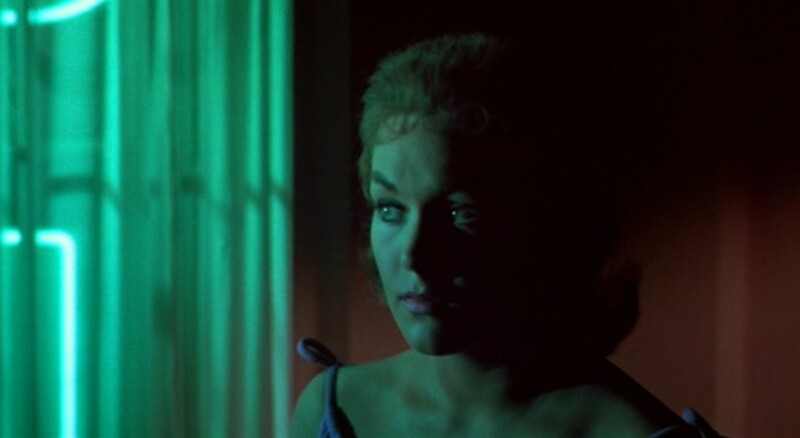 Getting a read on Judy Barton (Kim Novak), cloaked by "supernatural" green light in Alfred Hitchcock's Vertigo. After being solicited for a date by Scottie who notes she reminds him of someone (dead), Judy replies "Why, because I remind you of her? That's not very complimentary. And nothing else?" In a previous article, I briefly mentioned the concept of mirroring which has been a hot topic in neuroscience for the last two decades. The much debated notion is neurons fire both when a person acts and when another observes the same action performed, providing the neural basis of the capacity for emotions such as empathy. Sympathy, simply put, is indicative of the old saying "I feel for you, but I can't quite reach you." It disconnects whereas empathy draws us in and makes us feel what characters are feeling. Knowing how to utilize empathy effectively, as we will see later on, can distance us from the a character and actually draw us closer and align our emotions to an accomplice to murder instead. While there are ultimately many emotions, these form the core and others can often be attributed as variations (shame, for instance, is closely linked to sadness.) Using these seven in conjunction with one word to describe the purpose of a particular scene while outlining can help to ensure not only does it have meaning, but an emotion to be conveyed to the audience to give it that meaning as well. As Lisa Cron said, emotions determine the meaning of everything - particularly because they are the means by which interpret a character's perspective while also providing that much-needed measuring stick. Well, it goes back to perspective: we need to know who the character is, what makes them tick, what their strengths are, their fears, insecurities, etc. These will form the basis of their schema and how they view the world around them - which, in turn, allows us to see how they react to events. Let's face it, that's what a story is really all about: not just "events" happening on the page or screen, but how a main character (or others) react to the events. Their reaction, as discussed in the last article, is our window into what they feel and think and the basis for our empathy for them. 1) Vulnerability - This is important because a character who is vulnerable is an authentic character, opening themselves up to expose warts and all. Any film that utilizes a "fish out of water" concept is essentially creating vulnerability by exposing the character to an unfamiliar environment. 2) Valued Traits - These can be things such as loyalty, courage, love... think of Samwise Gamgee and how he would not allow Frodo Baggins go it alone on his quest in Lord of the Rings. 3) Universal Goal - As mentioned in a previous article regarding A Beautiful Mind, while John Nash pursues a goal of creating a new theorem, it's merely a means to an end to achieve something higher: mattering in the eyes of others (acceptance and acknowledgement of one and their efforts). The theorem isn't particularly relatable to the audience, but wanting - and needing - to connect with others and mattering certainly is. 4) Selflessness/Altruism - putting your character in a position where he cares about others more than he does himself - despite the potential consequences - can create a strong sense of connection as it did with Frodo Baggins. 5) Unjust Treatment - Rather self-explanatory, one doesn't need to look any further than last year's Academy Award Winner for Best Picture, 12 Years a Slave, for a prime example. 6) Change - A character trying to change their circumstances, or those of another, can arouse empathy much like we saw in The Blind Side. 7) Suffering - Whether it's internal conflict or external, physical pain, we tend to empathize with those who suffer - something Schindler's List portrays both equally in spades. While this isn't a definitive list by any means, it's enough to give one an idea of ways to build empathy into their characters. Ultimately these work best when the character itself plays a specific function within the story and has some thematic relevance - otherwise it may come across as forced. Alfred Hitchcock, the master of suspense that he was, deserves much credit to his, and his writers', ability to create - and manipulate - empathy within an audience. A character like Alex Sebastian in Notorious, despite being a Nazi sympathizer, shows more empathetic traits than his hardened American secret agent counterpart T.R. Devlin (Cary Grant), a charmless man with questionable morals at best. In Psycho, we follow the story of Marion Crane, watching her acknowledge the mistake she's made, head into the shower in an effort to "cleanse" herself with the intent of righting a wrong - only to be jolted with her death, our empathy suddenly transferred to Norman Bates who has to clean up after "Mother." While he goes to great lengths to cover-up the crime, we can't help but feel the conflict within as he's asked questions by Detective Arbogast then later essentially bullied and wrongly accused (well assumed, though ultimately motive-wise at least) by Sam Loomis. But it's Hitchcock's Vertigo which best demonstrates the power of empathy, shifting narrative - and audience - perspective with a heavy dose of dramatic irony from detective Scottie Ferguson to small town girl Judy Barton, accomplice to murder. I'm going to make the assumption those reading have actually seen the film. If you haven't...you can find a brief synopsis here, but please note: it recently topped Citizen Kane in critics' poll of greatest films - so do yourself a favor and watch it! "Dearest Scottie, and so you found me. This is the moment that I dreaded and hoped for, wondering what I would say and do if I ever saw you again. I wanted so to see you again just once. Now I’ll go, and you can give up your search. I want you to have peace of mind. You’ve nothing to blame yourself for. You were the victim. I was the tool and you the victim of Gavin Elster’s plan to murder his wife. He chose me to play the part because I looked like her. He dressed me up like her. He was quite safe because she lived in the country and rarely came to town. He chose you to be the witness to a suicide. The Carlotta story was part real, part invented to make you testify that Madeline wanted to kill herself. He knew of your illness. He knew you’d never get the stairs to the tower. He planned it so well. He made no mistakes. I made the mistake. I fell in love. That wasn’t part of the plan. I’m still in love with you, and I want you so to love me. If I had the nerve, I’d stay and lie, hoping that I could make you love me again as I am, for myself, and so forget the other and forget the past. But I don’t know whether I have the nerve to try." While exposing her as an accomplice to murder, the scene also shows Judy as being very much human with a desire, a need, compassion toward Scottie's plight, that she was herself used, and that she's in love - something that wasn't intended to happen on her part. As the scene ends, she questions her own courage, deliberates, and rips the confession up to emphasize that yes, she does indeed. If only she knew what she was getting herself into. These traits alone don't necessarily make us empathetic toward her - it's the plot and how it unfolds, particularly Scottie's treatment of her and her reaction as a result that ultimately makes us identify with her. Scottie, still obsessed with Madeline, attempts to make Judy over into her very image - and the audience watches in both suspense and horror as to how far his obsessive drive will go. Hitchcock shows here that one effective way to shift empathy is to decrease empathetic traits in another. The moment of horror for Judy when she realizes Scottie's obsessive desire to make her over into the image of not just any dead woman - the one she played as a role in an accomplice to murder. In this case, Scottie's objectification of Judy - despite our knowing the truth - works against him. The closer he gets to achieving his goal, the more Judy reacts emotionally, his unhealthy and obsessive drive met only by her own desire to be loved - and we watch it all unfold as she becomes selfless, letting herself be made over into the very image of his obsession. Scottie ultimately doesn't care anything about "Judy" or her persona, only that she looks and acts like the "Madeline" he fell in love with which was nothing more than an illusion to begin with - something of an irony as he's just as much of a representative of the past having a hold on her as she, as Madeline, is to him. That she's essentially "made over" into the role of Madeline twice only adds another level altogether. This obsession creates cognitive dissonance, making the audience uncomfortable with Scottie's behavior and thus distancing themselves emotionally from him. SCOTTIE: I'm trying to buy you a suit. JUDY: But I loved the second one she wore. And this one, it's beautiful. JUDY: You're looking for the suit she wore, for me. You want me to be dressed like her! JUDY: No, I won't do it! JUDY: No! I don't want any clothes, I don't want anything...I just want to get out of here. This all said, it's important to note that empathy has absolutely nothing to do with a character being "likable." Scotties' obsession might be creepy in a necrophiliac way, but it's witnessed with a sense of psychological malaise as we understand from the first two thirds of the film what he went through and how it affected him. In both cases, empathy is the outcome from having defined the characters' perspectives and the ability for the audience to recognize the emotions that are being experienced by one character to another on the screen - regardless of whether we like them or not - and that's what matters most because if we're not feeling, we're not reading.